I have been lusting over Chan Luu bracelets for months now, but the price tag was a bit out of budget for something I knew I could make on my own. All you need is leather cording, beads, thread and a button. You can make the bracelet short (so it only wraps around your wrist once) or long (and have it wrap around your wrist multiple times). 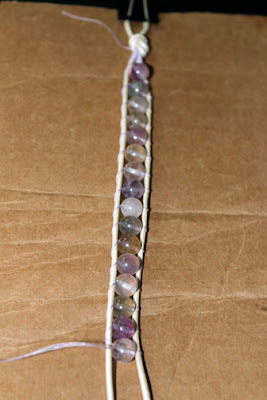 Step 1: Measure your wrist and determine how many times you want the bracelet to wrap around. Double that number and add 3 more inches. For instance: 2 yards will get it around a 7 inch wrist about 4 times. Step 2: Fold your leather cord in half. At the loop end, tie a knot about 3-4 inches from the end. Be sure your button will fit into the loop. 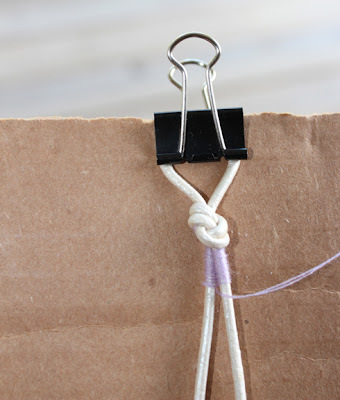 Attached binder clips to a piece of cardboard or use a clipboard and binder clips to hold the bracelet in place. Thread your needle. I used about a yard and a half for a single wrap bracelet. If you don’t have enough you can always knot the thread and glue it. Knot your thread to your cord and bring your needle up under the right cord through the center. Step 3: Bring the thread under the right. Step 4: and then under the left. Step 5: Repeat until you have your desired amount. Step 6: Add a bead to the thread. Step 7: Bring the thread under the right. Step 8: Through the bead. Step 9: and under the left. Repeat steps 7, 8 and 9 until you reach your desired length. Step 10: Once you have your desired length repeat steps 3 and 4 until you match the same amount of thread at the top. 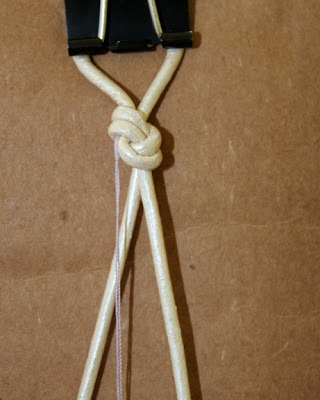 Tie a knot and add your button to one side of the leather cord - knot it. Add glue to the end of your thread and you're finished! Love it! Always up for DIY jewelry! This is so, so pretty and something I think I might be able to attempt with my clutzy fingers!